Lightweight and versatile, the Sony E Series 18-110mm F4 G OSS Lens covers the most frequently-used focal range with a constant f4 maximum aperture. 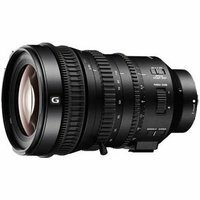 Designed for videographers and cinematographers, it features Sonys Smooth Motion Optics to minimise focus shifting and other anomalies and ensure consistently high image quality. Sonys Optical SteadyShot image stabilisation is also built-in.